These succulent baby back ribs are perfectly tender and juicy. A simple sauce with apple juice, apple cider vinegar and prepared barbecue sauce imparts Southern flavor with only a few ingredients. The ribs are made quick and easy by using the MultiPot Pressure Cooker. But if you still want that crisp crust as you bite into each rib, don't worry! In this version you finish off the ribs in the oven until the sauce is caramelized and browned. It's the best of both worlds! Stack ribs in a pressure cooker pot; pour in apple juice and vinegar. Select Meat/Stew and cook for 20 minutes on High pressure. Meanwhile, preheat oven to oven to 400°F (200°C). Line a sheet pan with aluminum foil. Remove ribs to the prepared sheet. Discard cooking liquid. 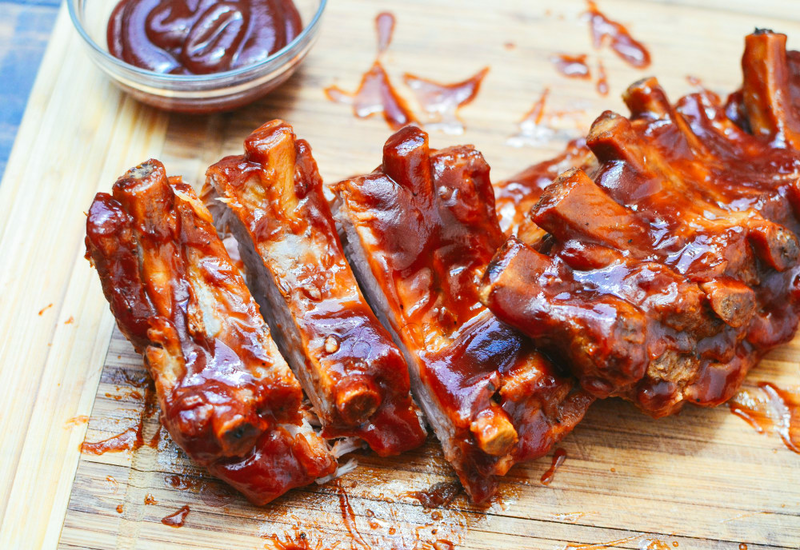 Brush barbeque sauce onto both sides of ribs. Bake ribs in preheated oven until sauce is caramelized and browned, about 10 minutes; remove from oven and cut ribs into individual bones to serve. Before preparing this recipe, be sure to remove the membrane from the baby back ribs. Simply slide a knife under the membrane and over the bone at one end of the rack. Lift and loosen the membrane until it tears away from the meat. If you grab the membrane with a paper towel, it helps to pull it all the way off from end to end. Per Serving: 963 calories; 54g fat; 58.3g carbohydrates; 57g protein; 206mg cholesterol; 997mg sodium. This is how I would do ribs in my slow cooker, but now I can do them in less than an hour instead of all day and still get the same flavor. Soooooo tender and delicious! When the weather is too bad to grill ribs outdoors, this is my go to recipe. The cleanup is really easy since they are prepared with the pressure cooker. Simple but boasting a ton of flavor. If you like ribs, you definitely must try making them pressure-cooked. I heard that you could make ribs in the pressure cooker, but I was a bit of a skeptic. Finally I tried this recipe and was pleasantly surprised. They were really good! You still have to put them in the oven to caramelize and brown them, but other than that this was easy to make and very delicious. Great for when I don't feel like firing up the grill or have a ton of time to cook. I really loved the tang that the apple cider vinegar and apple juice gave to these ribs. I usually do my ribs on the barbecue, but these were pretty good for winter ribs. I used Sweet Baby Rays for the bbq sauce and made a coleslaw for the side. I followed this recipe once before and for me, the apple cider vinegar absolutely ruined it. Tonight I made this using pork loin back ribs instead of baby backs and they were so much meatier and tastier. I only used 1 cup of Motts Natural apple juice and brushed the precut ribs with Kraft slow simmered Hickory Smoke barbecue sauce. Very delicious sauce! NO RUB. I pressure cooked for 30 minuets, then coated again and 10 minuets in the oven. Ribs came out fantastic! Meat tender and no fat to eat or spit out. These ribs weren’t bad at all. I wasn’t convinced that the pressure cooker would make delicious, juicy, tender ribs, but yet again I am impressed. We had the left overs the next day, just heated in the oven. Wow, Best ribs I’ve ever had. So moist and so tender, they were falling off the bone; and so easy too! Ribs were great! We went to Costco and got 6.5lbs of Pork Spareribs. I cut them into individual ribs and stacked 3lbs in the pot with the trivet rack so they were above the liquids. Cooked, added to oven and started the next batch. Everyone loved them! Enjoy! Easy to make and turned out great! Meat was falling off the bone. Tastes great! My Mealthy multipot arrived tonight and I had to try it out. I had no apple juice, so in went three cups water, one cup apple cider vinegar. Ribs were halved, and halved again. I used the stainless rack to keep them above the liquid. 20 minutes on high, and I basted both sides with my own version of BBQ sauce (which includes red pepper flakes, any store-bought sauce (Kraft is a great base), cider vinegar, and a squirt of yellow mustard), so you can adjust to your tastes. Basted the ribs three times to get a good sticky coat while they were in the oven. This turned out wonderful! I'll try pressure cooking them at 30 minutes next time so I can see the difference. Way too much liquid - and don't need to cut up the ribs unless planning to really stuff the pot full. I drop liquid to 1 8oz drink size apple juice and a splash of apple cider vinegar for flavor, add a dash of liquid smoke if I happen to have it in the pantry, and often put some or all of an onion in the mix too. Wrap the ribs and put on the trivet, meat out, bone to the inside, and add about 2 min to cook time since I'm at high altitude. I adapted this recipe based on other reviewers comments and what I had on hand. I used 3 lbs Baby back ribs, 4oz. SBR sauce with 10oz. water, a tbsp of Apple cider vinegar and a tsp of liquid smoke stirred in pot. Cut Baby back ribs individually and thoroughly covered with liquid in bottom of pot. Sealed lid, set at high pressure and cooked 30 min, quick released steam, removed ribs to foil (spritzed with Pam) lined cooking sheet, brushed thick coat of Sweet Baby Ray's and finished in 375 degree oven for 10 min. Very tasty, tender ribs in a little under an hour! Meat was not falling off the bone when brushing with sauce, but easily fell off the bone while eating them. Thanks for the helpful recipe and comments, this was my 1st use of my new Multipot, very happy so far. This recipe was blessed by the gods!!! 😭😭😭😭😭 PERFECT ribs!! Cannot complain! Ok I try it and not bad.. Next time I will try marinating the ribs for a day with the barbecue sauce. Used 4 cups of water and dash of bbq sauce for 30mins. Then follow up with oven and more bbq sauce for ten mins.